We have been busy as elves!!! It has been a very busy couple of weeks with all the inventory sales, tying up all the loose ends and transitioning the business and such from Joan over to me. I am looking forward to getting to know you all and doing business with you. At this point, as I do not know many of you as well as Joan, it would be very helpful if you would include both your first name AND last name when ordering either by phone or e-mail. Also, if you would be sure to put ITEM NUMBERS and DESCRIPTIONS that would be great so we can avoid mistakes. **When the Customer Files were transferred over from Joan to me, all payment information was deleted for security measures. Therefore, I will need to know your preferred method of payment and credit card information at least for the first order you place. Sorry for this inconvenience. Be sure to check the website out tomorrow to see what I have been busy making this weekend with a new product we just received....I am addicted and having so much fun! Also, Joan has set up her new blog and would love for you to visit her at www.joanstouch.com - if you submit your email address on the right hand side of her blog you will receive her post updates via email. She is currently still working on it. Good luck Terri. I wish you many years of success. Can't wait to see what tomorrow brings. Best wishes on your new business! I'm sure you will find Joan's following of customers fun and eager to check out all your new items. Look forward to working (hmmm, spending my money) with you. Glad you are posting so soon can't wait to see what "New" product you are working with, I hope it is what I am trying to find and order right now. If not I will put you on the trail tomorrow to get for me. Looking forward to the new "Joans garden"
The best of luck to you Terri. Looking forward to see what you have in store for tomorrow. Good luck. I look forward to a friendly relationship with you, as I have had with Joan. I also have a blog if you would like to view it. Joan was signed up to receive email every time I posted. Am looking forward to seeing what you have in store for us. Welcome Terri and I wish you very good luck with your new business venture. I can't wait to see what you have in store for us. I look forward to doing business with you in the near future! Hi Terri. Congratulations on your new venture. Wishing you all the best. Looking forward to reading your posts. I will check out Joan's blog. Thanks for the link. By the by did you know you are posting as Joan still? Just in case you aren't aware. I know you have a lot to get sorted and it's only a little detail. Hope you don't mind me saying. Congrats again. Looking forward to getting to know you. Hi Terri! Looking forward to getting to know you better - can't wait to see your store! HOORAY and CONGRATS!! I can't wait to see what you have in store for us in the future! All the best to you and your family this holiday season! Welcome aboard. Look forward to seeing your goodies. Happy Holidays and prosperous New Year. Congrats on the new business Terri, look forward to doing business with you, as I have with Joan, can't wait to see what you do, Good Luck with All!! Best wishes in your new adventures of having your own store! I wish you much success and happiness in the future and look forward to getting to know you :) Happy holidays!! 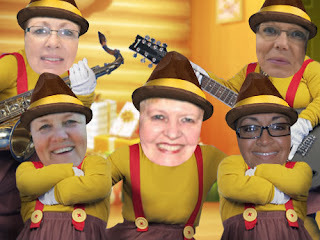 Love the elves, so much fun gave me a wonderful laugh watching all of the fun there in the elf workshop.